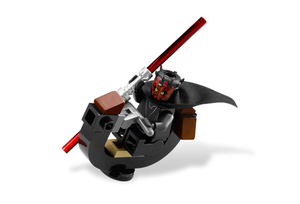 ―Darth Maul, to the tune of "Duel of the Fates" in "LEGO Star Wars: The Empire Strikes Out"
Darth Maul is a Star Wars Episode I: The Phantom Menace minifigure released in 1999. He is based on the Zabrak Sith Lord character from the Star Wars universe of the same name. 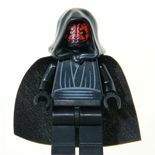 Originally released in the first year of Star Wars LEGO (1999), a total of seven variations have been made of the Sith Lord to date. 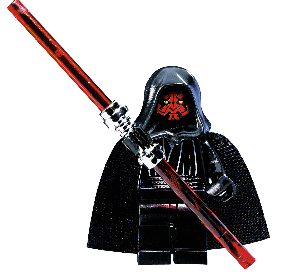 The first Minifigure form of Darth Maul was released in 1999, as a part of the Star Wars Episode I line, in two sets. This variant of Maul has black legs and a black torso piece with grey printing on it to depict his Sith robes. Maul's headpiece is also black, with red printing on the front to show his tattoos, and his yellow eyes were also printed on. Maul comes with a black cape and hood, and also a red-bladed lightsaber with a shiny silver hilt. The lightsaber either had a single blade piece like in the 7101 Lightsaber Duel, or two blade pieces, where one in inserted into the hilt in each end to form a double-bladed lightsaber, like in the 7151 Sith Infiltrator. Darth Maul on his speeder in the 2011 variant. Maul's second variant came in 2007, along with the remake of Maul's Sith Infiltrator, the 7663 Sith Infiltrator. This variant differs slightly in the torso piece, where the grey printing was updated, but still serves the function of showing Maul's robe. In the head piece, the pattern of the red tattoos were changed slightly, and Maul's eyes were also given black pupils. Despite these differences, Maul retains his hood and cape accessories, and was released with a double-bladed lightsaber. 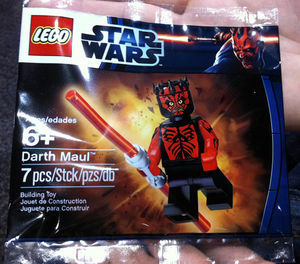 A new Darth Maul was released in 2009 with the 2851193 LEGO Star Wars Darth Maul Watch. He had the same pieces as his 2007 variant, except for the torso piece. The robe depicted has a different belt, and is folded differently. This torso piece is commonly seen on several of the more recent variants of Palpatine. Darth Maul was redesigned once again in 2011 for the latest incarnation of his Sith Infiltrator. As is typical with all Darth Maul variants, this minifigure has a plain black leg piece, a black cape, and a double-bladed lightsaber. Maul's torso piece is again black, with printing similar to his first two variants. However, the centre of the robe in this variant is more open, and has less lines running down it. The printing for the belt also has a different shape, and the lines are thinner. A small rectangle is also printed on the lower right-hand side of the belt. Maul's tattoo pattern was once again changed, as were his eyes and expression. For this variant, Maul has an interchangeable black hood, and a newly released piece, which goes on the top of Maul's head to represent the top of Maul's head. This piece is black, but has red printing on the front to match the red printing at the top of the head piece in an attempt to make this piece and the head piece appear joined. Eight horns come out from the side of the piece, representing the horns commonly present on Zabraks in the Star Wars universe. In 2012, a promotional shirtless Darth Maul was released. In this variant, he has completely black legs. His torso is black but has printing on both sides depicting a grey-and-black belt and red printing depicting a bare chest. Maul's arms are red with black jagged marking on them, and his hands are red as well. Maul's head's base color is black, but with red face markings, light green/yellow eyes, and sort of sand colored teeth markings that creating an angry expression. Maul's 'horn' piece is black with some red markings at the front that match his head markings. A Santa version was also released in the 2012 Star Wars Advent Calendar. This variant has plain red legs, red arms, a red cape, and the same hood piece found on Ice Fisherman from the series 5 Minifigures figures, but in red and white. His torso printing (back and front) is similar to his 2011 figure's torso, but with more creases, a puffy white collar, and a candy cane in back. 2013 saw the release of a Darth Maul from The Clone Wars line. In this variant, Darth Maul's face printing has slightly simplified tattoos, as well as larger yellow eyes reflecting his appearance in the The Clone Wars TV series. He has arm printing further depicting his tattoos, as well as torso printing depicting tattoos, a metal collar near the top, and the beginning of his robotic lower body near the bottom. This variant of Darth Maul also introduces a new grey hip piece with "handles" on which clip-bearing pieces can be attached. Two grey robotic legs attach to this piece. Darth Maul also wields a red lightsaber and a darksaber, and features his black and red "horn" piece. 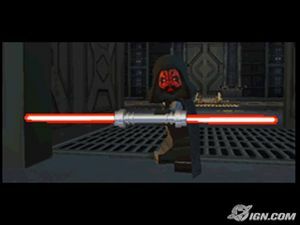 Darth Maul in LEGO Star Wars: The Complete Saga. 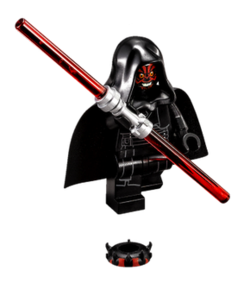 Darth Maul has appeared in all four video games to date- LEGO Star Wars: The Video Game, LEGO Star Wars: The Complete Saga, and by using save data from the first game, he can appear in LEGO Star Wars II: The Original Trilogy. Maul's appearances in these games appear to be a mixture of his two physical variants- in the video games, his eyes have pupils like the 2007 variant, but his torso design appears to be more like his 1999 variant. The Sith Lord has a double-bladed lightsaber in the video games, and is able to access areas which can only be accessed by those who use the Dark Side of the Force. He has a extra long lightsaber hilt in the game. He also appears in LEGO Star Wars III: The Clone Wars after unlocking ten minikits. Darth Maul was Darth Sidious' Sith apprentice, trained from infancy in the ways of the Dark Side of the Force after being born into the Nightbrothers on Dathomir. His weapon of choice was his red double-bladed lightsaber. When Sidious conspired with the Trade Federation to invade Naboo, Maul was dispatched by his master to find Naboo's Queen, Padmé Amidala, and her two Jedi protectors, Master Qui-Gon Jinn and his apprentice, Obi-Wan Kenobi, after the managed to slip past the Trade Federation's blockade. Maul tracked down their Naboo cruiser in his Sith Infiltrator to the planet of Tatooine, where he sent out three Sith Probe Droids to find the Naboo party, and they successfully located them as they were preparing to leave. The Sith Lord proceeded to go after Qui-Gon on his speeder bike, who was taking a young boy by the name of Anakin Skywalker back to the Naboo cruiser. Maul engaged Qui-Gon in a lightsaber duel, choosing to use only a single blade. However, Qui-Gon managed to escape from the duel by leaping onto the ship's boarding ramp. Back on Naboo, Maul again encountered Qui-Gon, this time along with Kenobi. The three dueled with their lightsabers (with Maul using both blades of his lightsaber), but the Jedi and Sith remained equals, until Maul managed to gain an advantage and stab Qui-Gon through the chest, the wound eventually causing the Master to die. Obi-Wan fought with great ferocity after this event, but he too was left virtually defeated, until he managed to jump out of the melting pit he was pushed into, pulling his master's lightsaber to him at the same time by using the Force, and sliced Darth Maul in half. Maul then fell into a melting pit. However, Maul managed to survive. Ten years later during the Clone Wars, Maul's brother, Savage Opress, was sent to find Darth Maul. Opress discovered Maul living on the Outer Rim with in a cave with cybernetic spider-like legs. Over the years, Maul went mad, which caused him to forget certain events. However, his mind was restored by the leader of the Nightsisters, Mother Talzin, and prosthetic legs with a lower torso were fashioned for him. He then went with Opress to find Kenobi and engaged him in a duel, before Kenobi fled with the help of Asajj Ventress. Maul and his brother soon began attacking Republic installations and looting them, eventually coming upon planet Florrum. There, he encountered Hondo Ohnaka and recruited many of the pirate's men using the money he had stolen. However, before Maul could finish his plan, Kenobi and another Jedi arrived at Florrum, answering a call for help from Hondo. In the ensuing fight, the second Jedi was killed, Opress's arm was cut off by Kenobi and Maul's mechanical legs were severely damaged by blaster fire from the pirates, who were now back under Hondo's command. Maul and Opress barely managed to escape, making to their ship and flee in the escape pod before it was shot down by Hondo's men. The brothers were eventually rendered comatose, drifting through space in the pod. When near death, they were discovered and rescued by Death Watch, whose leader, Pre Vizsla, recognised their potential value. Maul had his triple-jointed mechanical legs replaced with more humanoid ones as he and his brother were nursed back to health. Maul decided to join Vizsla to help the warrior take over his home planet of Mandalore, in return for Vizsla's aid in capturing and killing Obi-Wan Kenobi, with whom the death Watch also had a grudge. Their plan was soon put into action and the Death Watch began absorbing various crime gangs, the Black Sun, Hutt Clans, and Pykes chief among them. Maul began to display a superior and disdainful attitude towards Vizsla, even giving the Death Watch leader orders and admonishing him at times. The new assembled gangs, now known as the Shadow Collective, attacked Mandalore. The planet's current leader, Duchess Satine Kryze, was powerless to stop them and when the Death Watch miraculously appeared, "saving" the people of Mandalore from the Shadow Collective, Pre Vizsla and his Mandalorians had enormous support. Vizsla was able to take over Mandalore with his subjects cheering him on, while Kryze was locked in a cell. Soon after, Vizsla ordered the arrest of Maul and his brother, resenting the treatment he had been getting and fearing they would try to eliminate him. Maul and Opress escaped their cell and made their way to the capital, where Maul challenged Vizsla to single combat. As a warrior bound by honour, Vizsla could not refuse in front of his men. After a lengthy duel, Maul killed Vizsla and claimed his position as the new leader. While most swore allegiance to Mail, Vizsla's lieutenant, Bo-Katan, refused to accept an "outsider". She and her division, the Nite Owls, branched off and fled. Maul had his political puppet, Prime Minister Almec, "explain" how Satine Kryze had killed Vizsla and how Almec was now to take his place, leaving Maul to be the secret ruler of Mandalore and Death Watch. As anticipated, Bo-Katan attempted to free Satine, who just managed to contact the Republic before being captured again my Maul's Mandalorians, now known as Super Commandos. But the deed was done, and Obi-Wan Kenobi, Satine's one-time lover, soon arrived on Mandalore. He managed to free Satine and get her on board is ship before Maul confronted him, having his craft blown up and then capturing Kenobi. He exacted his revenge on the Jedi by killing Satine before the Jedi and then sending him to his cell. However, Maul was interrupted by the arrival of his former master, Darth Sidious, who had begun to consider his former apprentice as a rival. Sidious had decided to end Maul's Shadow Collective and all his plans before they became a threat, and in the ensuing fight killed Opress and defeated Maul. After his capture, Sidious allowed Maul to escape as a part of a plan to locate Mother Talzin, believing Maul would lead him to the Nightsister. Maul eventually escaped from Sidious and his new apprentice Count Dooku, joining forces with Mother Talzin, revealed as his mother, although Talzin was killed. Maul lost control of the Mandalorians and briefly fought former Jedi padawan Ahsoka Tano. He escaped to the planet Malachor to find an ancient superweapon. Seventeen years later, Maul was found by the Rebel Alliance member Ezra Bridger. Maul introduced himself as the "Old Master", and later revealed his identity. His motives were later questioned by Jedi Knight Kanan Jarrus, and Tano, who was now working with the rebels. Maul killed the Seventh Sister before betraying and blinding Kanan. Maul sought to take Ezra as his own apprentice, but failed. Maul escaped in a TIE fighter and later captured the group of rebels again, attempting to use holocrons to find Obi-Wan for revenge. Maul failed and tried again with help from a Nightsister potion. This time he found out Kenobi was on the planet Tatooine, where he had fought Qui-Gon thirty years before. Maul arrived on Tatooine and found Obi-Wan after a long, desperate search. They dueled, but Maul was killed at the third stroke of their battle, saying that he and Obi-Wan would be avenged by Luke Skywalker, who he had found out was being protected by Obi-Wan on the planet. The 2013 The Clone Wars variant uses two new bricks: his legs and the piece that connects his legs to his torso. In both watches Darth Maul appears in, he comes with a torso used by Emperor Palpatine. By the time Maul took control of Death Watch, his robot legs had been replaced by ones that looked like a man's. However, in the set 75022 Mandalorian Speeder, his legs are those from before meeting with the Mandalorians. 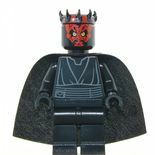 Darth Maul is currently one of six minifigures to be based on a Zabrak, the others being Eeth Koth, Agen Kolar, Savage Opress, Sugi and an Old Republic era Jedi Knight. This page was last edited on 5 July 2017, at 15:53.